A chalazion forms when one of the meibomian or tarsal glands of the eyelid becomes blocked. The oily contents it normally releases into the tear film instead build up within the eyelid, forming a cyst. This is initally tender, and may become very inflamed. This inflammation is usually a result of pressure – infection is rare. Many chalazia resolve spontaneously, or sometimes discharging through the skin. This may however take many months. Hot bathing and lid hygiene (see Blepharitis) may prevent a chalazion forming if started in the early stages of the condition, but once fully formed, incision and curettage is the only means of removing a chalazion. It can be done quickly in the out-patient clinic, under local anaesthetic. Anaesthetic eyedrops are given and then an injection of anaesthetic into the affected eyelid. The eyelid is then gently fliiped over to expose the inner surface. This is then incised and the contents of the cyst curretted (scraped) out. Antiobiotic ointment is then applied with a pad. This is left on for 4 hours to reduce bruising, with antibiotic ointment given to apply 4 times daily for a further week. 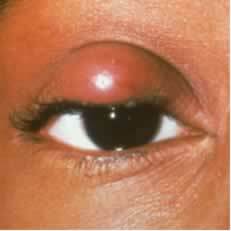 Bruising of the eyelid is common and may take a week or two to go. Infection is rare. Often the lid is thickened and inflamed around the cyst, this thickening may take a few weeks to settle even after incision and curretage. Chalazia may recur, or may form in other eyelids or parts of the same eyelid.